As a huge fan of Indian food, chef Andre is the mastermind behind tonight’s delicious yoghurt-marinated salmon recipe. When we asked him about the inspiration behind this recipe, here’s what he said: “Using yoghurt as a marinade makes the tandoori spice mix spice warm rather than super spicy. 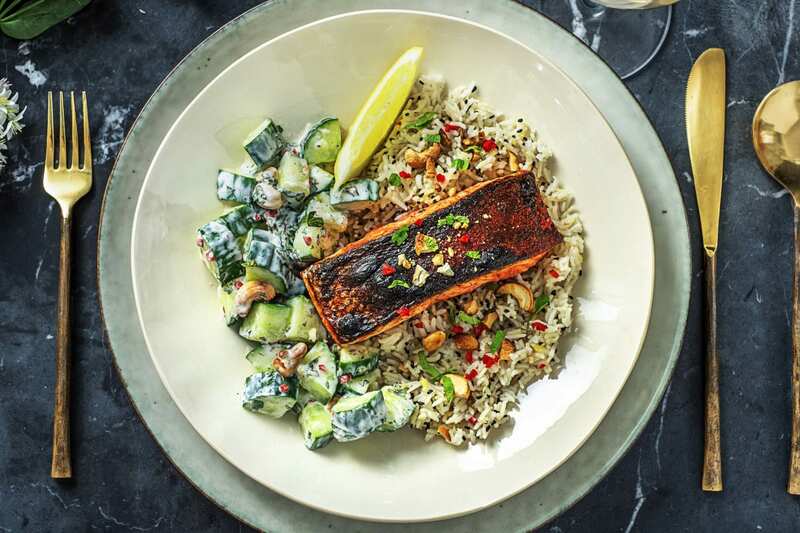 When you grill something that's been marinated in yoghurt you get a lovely charred flavour which works particularly well with salmon!” Served with a zesty cucumber salad and basmati rice, this recipe is the perfect way to add a little bit of lowkey luxury to your menu. Pop 1/4 of the yoghurt in a large bowl and mix in the Tandoori spice and a pinch of salt and pepper. 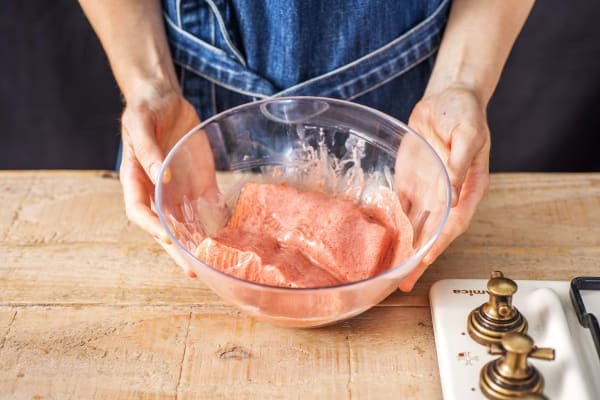 Add the salmon fillets to the bowl and gently turn to coat well in the marinade. Cover and set aside in the fridge. IMPORTANT: Remember to wash your hands after handling raw fish. 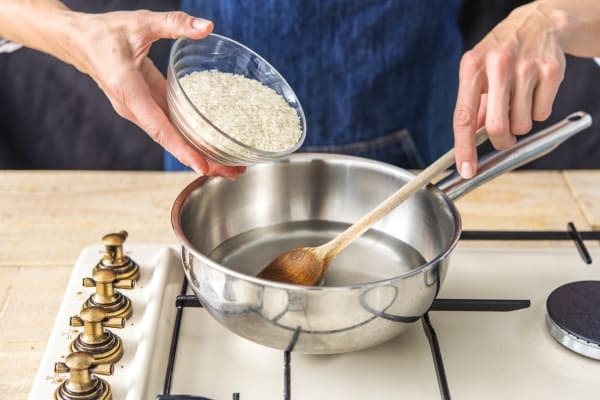 Pour the water for the rice (see ingredients for amount) into a saucepan and bring to the boil. When boiling, stir in the rice and nigella seeds, lower the heat to medium and pop a lid on the pan. Leave to cook for 10 mins, then remove the pan from the heat (still covered) and leave to the side for another 10 mins or until ready to serve (the rice will continue to cook in its own steam). Meanwhile, heat a frying pan on high heat (no oil). Add the cashews and toast, tossing the pan occasionlly, until golden brown. TIP: Watch them like a hawk as they can burn easily! 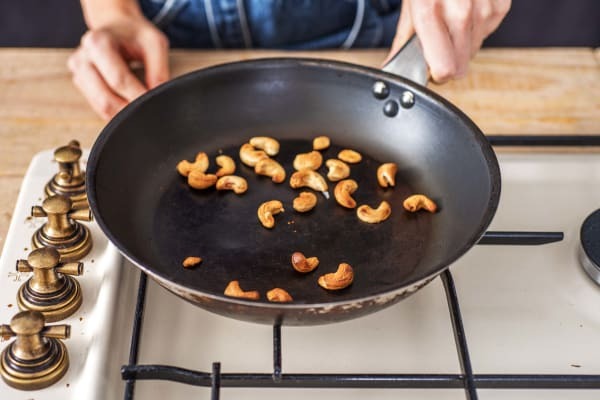 When nicely toasted, remove the pan from the heat and pop the cashews in a bowl. Preheat your grill to high and line a baking tray with a piece of lightly oiled foil. Zest the lemon. Halve the chilli lengthways, deseed and finely chop. Strip the mint leaves from the stalks and finely chop (discard the stalks). Trim the cucumber then quarter lengthways. Chop widthways into small chunks. Pop the cucumber, half the mint and half the chilli in a bowl. Stir in the remaining yoghurt. Halve the lemon and add a squeeze of lemon juice. Season well with salt and pepper. 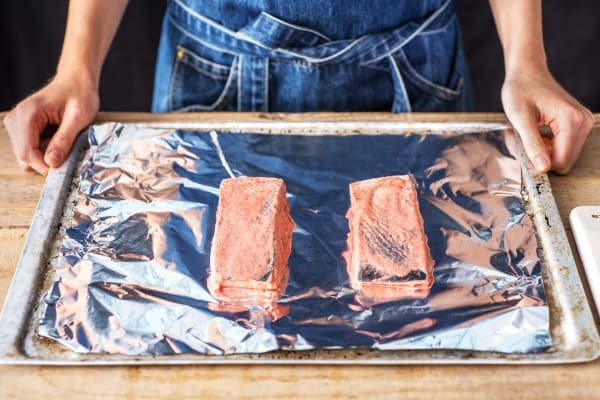 Remove the salmon from the fridge and place skin side up on the baking tray. TIP: You want to keep the marinade on the fish, so don't wipe it all off! Discard any marinade left in the bowl. Grill the salmon for 4-5 mins, then turn over and grill, skin-side down, for a further 4-5 mins. TIP: Watch carefully - a slight char is fine, but you don't want the fish to burn! IMPORTANT: The fish is cooked when opaque in the centre. Fluff the rice up with a fork and stir through the lemon zest. 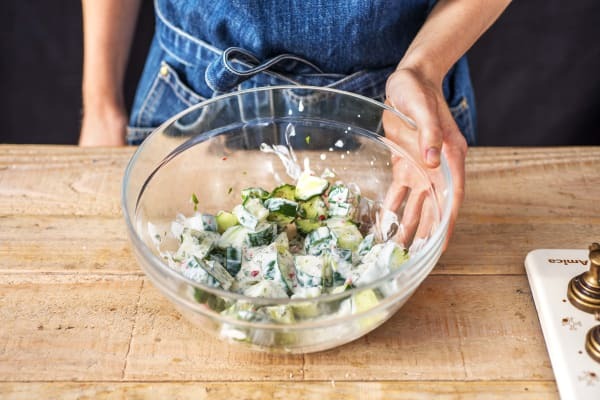 Stir half the cashews through the cucumber salad. 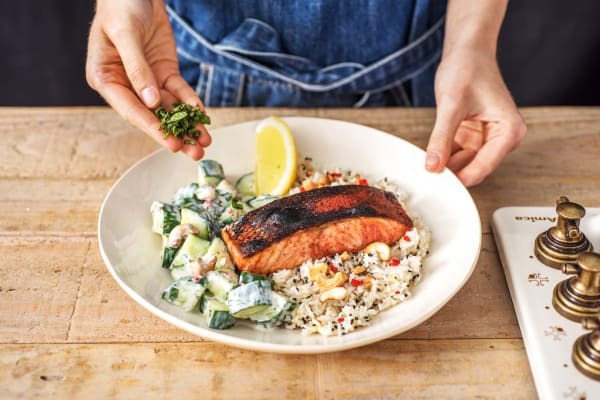 Serve the rice topped with the grilled Tandoori salmon and a sprinkling of remaining mint, chilli (for those who like a kick), cashews and the remaining lemon, chopped into wedges. Serve the salad alongside. Enjoy!